Your own personal energy code assistant in the palm of your hand – helping you manage compliance of new home construction projects! 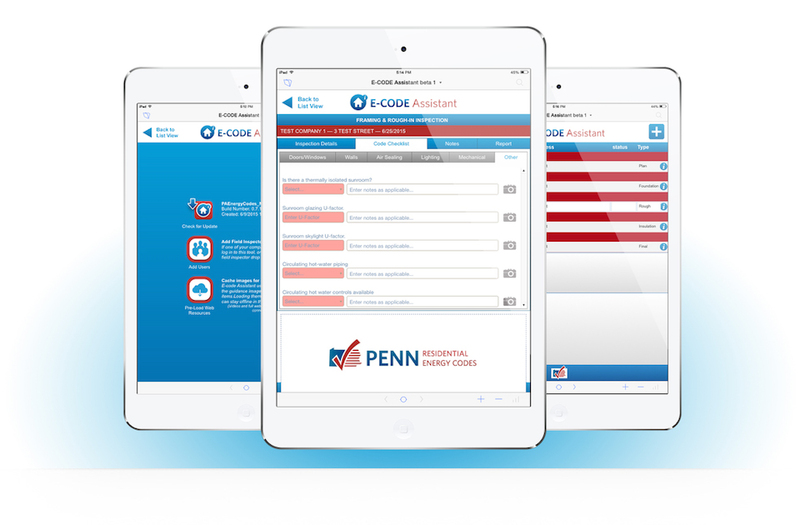 E-CODE Assistant was specially developed to answer your questions, provide visual examples, and retain a current checklist to make sure your projects meet the required energy code in Pennsylvania. This app is intended for use by builders/raters/code officials working in the Pennsylvania study region. *Additional users can be added to an account once the installation is complete. *Downloads are not provided instantly. Submissions are manually reviewed and approved within 1-2 business days. Create a password for the iPad App login. Please choose a password that you do not use for other accounts as it will be visible to program administrators.